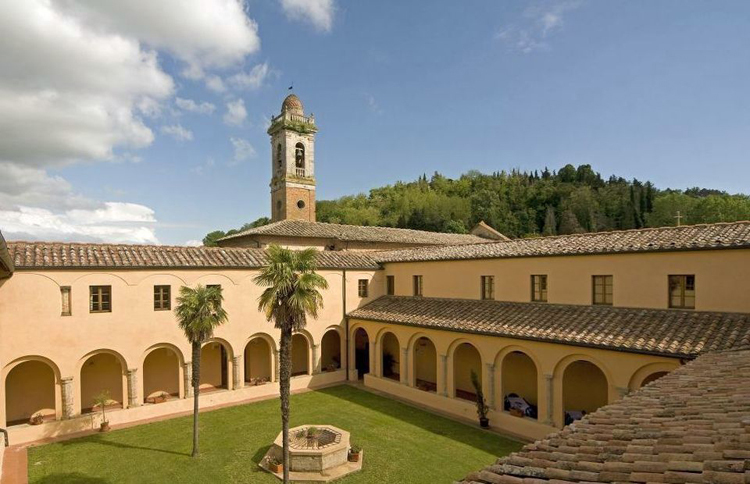 Abbeys, monasteries, convents and churches dot the Tuscan countryside; some of them have been transformed into boutique hotels or simple B&Bs to welcome travelers and modern-day ‘pilgrims’. Guarding beautiful cloisters, gardens, chapels and works of art, they’re often open even to outside visitors. We picked five ancient religious complexes for a different stay, filled with mystical charm. 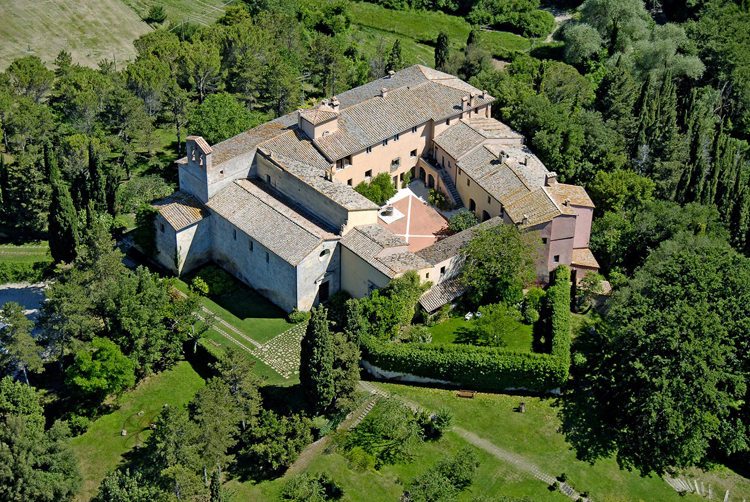 In an idyllic location five kilometers from Siena, surrounded by centuries-old olive groves, the 24,000-square-meter Certosa di Pontignano is one of only ten chartreuses from the 14th century left in Italy. The ancient cells of the Carthusian monks have been converted into nine apartments; rooms are located within the main cloister, and are offered in different categories: comfort, superior, suite. The entire location is spectacular, with three cloisters, a 14th-century well and an ancient oven still working, an Italian-style garden with aromatic herbs, a centuries-old magnolia, and a botanical garden. The 16th-century Church of San Pietro was frescoed by Bernardino Poccetti, who also painted The Last Supper in the dining hall. Open for guided visits year round, reservation required. Visit the website here. An abbey dating to the 11th century, Abbazia di Spineto stands at the foot of Mount Cetona, between Unesco-inscribed Val d’Orcia and Val di Chiana. 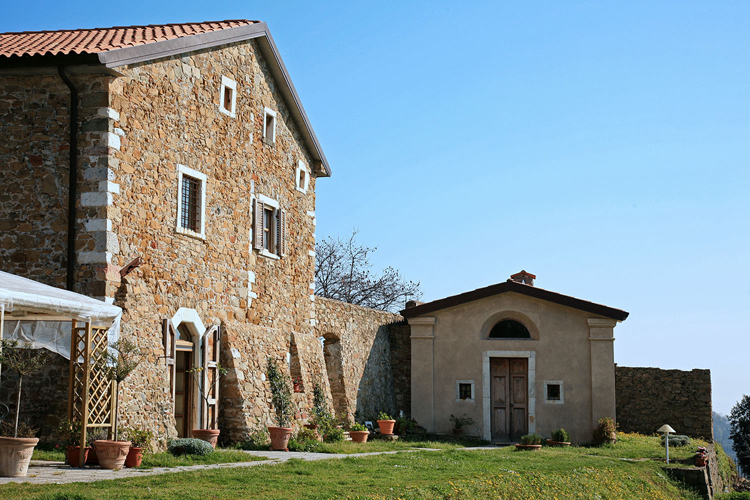 The entire complex, surrounded by 800 hectares of land cultivated organically and for Cinta Senese breeding (a breed of domestic pig from the province of Siena), was restored in the 1980s maintaining the spirit of the place while adding modern comforts. There are 11 luxury ‘casali’ (farmhouses), each with their own swimming pool, often located on a small hilltop with a gorgeous view. Pienza, Montepulciano, Cortona, Bagno Vignoni are all close by. Meetings and weddings can also be organized. Open year round. Visit the website here. Set among ancient olive groves, vineyards, pines and strawberry trees, with views of the Apuan Alps and the sea from every side of the property, Convento La Perla was restored after a period of neglect using the local materials, such as the marbles of nearby Carrara. It now boasts four rooms, each with whirlpool tub, a large communal kitchen, and a frescoed living room. The location is strategic, in the far north of Tuscany, near Liguria’s Cinque Terre, Versilia, the Apuan Alps, and Carrara, famous the world over for the production of fine marble. Open mid-March to November. For visits by appointment only. Visit the website here. A short walk from the Etruscan walls of Volterra, Chiostro delle Monache is a former Franciscan monastery built alongside the adjacent Church of San Girolamo in 1445. Initially restored as a hostel, it now offers private rooms as well, simply furnished, with private bathroom, ideal for travelers on a budget, families, business and group travel. The cloister, built on a design by Michelozzo, the hall with a 15th-century fresco, the Church of San Girolamo with glazed earthenware by Giovanni della Robbia are open for visits to outside visitors. Within walking distance (one kilometer) of Porta a Selci and the Museum Guarnacci, yet in a quiet location removed from traffic, Chiostro delle Monache stands in an ideal location to visit Tuscany’s amazing cities, such as Florence, Pisa, Lucca , Siena, as well as the coast. 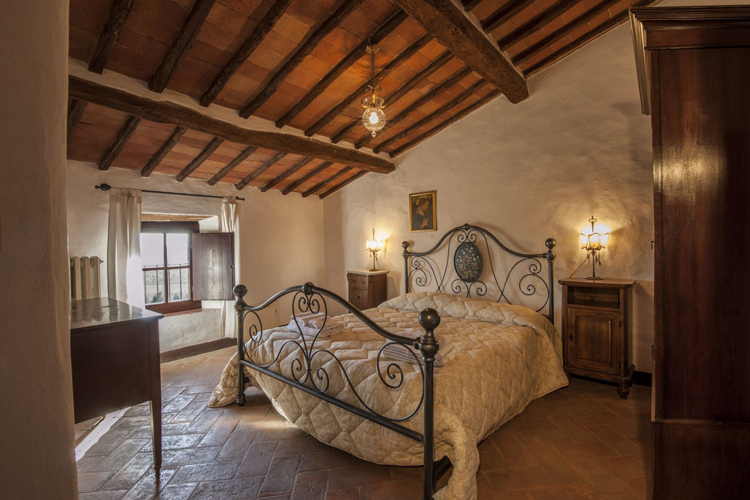 This 30-room agriturismo is housed within the monumental complex of Sant'Anna in Camprena, a former Benedictine monastery dating to the 15th century. 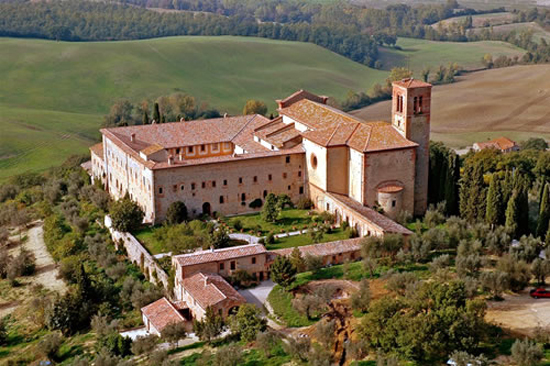 Just 6 km from Pienza, amid the outstanding countryside of the Val d’Orcia and the Crete Senesi, Monastero di Sant’Anna in Camprena is a place of great charm and spirituality. The rooms, obtained from the former cells, have no TV and no Internet connection. The filming location for some scenes from The English Patient, it features several works of art, including a tapestry with the genealogical tree of the Piccolomini family, a noble family prominent in Sienese politics in the Middle Ages, of which Pope Pius II was a member, and frescoes by Renaissance painter Sodoma. Open April to October. Open for outside visits, except for the restaurant, which is only for guests, and uses organic products from the farm. Visit the website here. 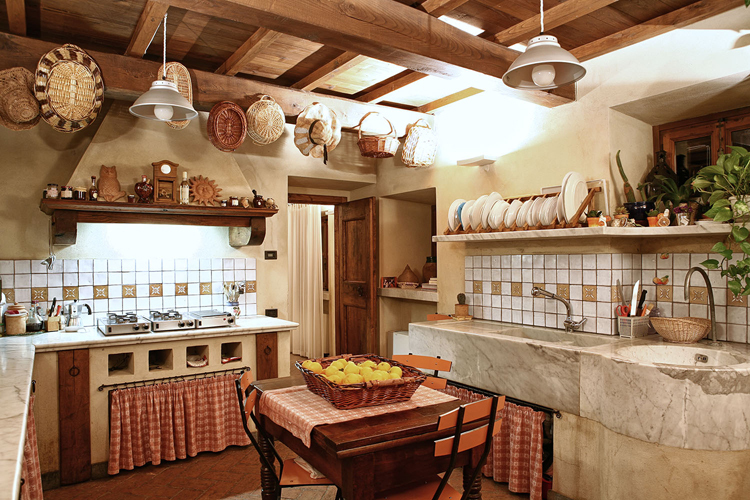 For more great places to stay in Tuscany, visit our dedicated page.